If you’re just tuning in, check out the other parts of this series on emotions & the brain! Essential oils and ... "aromatherapy." Is it just me, or does that word have that effect on you too? Back before I knew about the very physical, practical side of essential oils (and even for a few years afterwards), the word "aromatherapy" always made me scoff a little. Though I adored their smell and loved how I felt while inhaling essential oils, I mostly thought the concept was nonsense. Fru-fru. Specially-made for the retired, wealthy sector who had the time and money for non-essentials, OR, for the Bohemian tree-huggers who wanted a placebo effect to get through the day with zen and bliss. Besides...I was a very emotionally balanced individual... I didn't need any "therapy." Ha. I mean...I'd seen the headlines, and I'd read some of the medical studies. Antib*cterial, anti-tum*ral, anti-cl*tting properties? Well, of course. Those are practical things worth paying for. And there's science. But... having properties listed as uplifting, or calming, or grounding? Those, I said to myself, are not practical things worth paying for. And, there was no science (or so I thought). Are the "Emotional Blends" just a bunch of hype? Oh man. I remember 3 years ago, staring at those names of Young Living's emotional oil blends. "Joy." "Harmony." "Forgiveness." Seriously?? Guess I can expect rainbows and unicorns to appear out of the shadows as well, right? Um, no. We all know there are no quick-fixes. For these to work, you gotta actually do the work of dealing with your emotional stuff and neither stuffing it anymore, nor excusing it. That being said... these oils are basically WD-40 for the gears of your mind to be able to do just that - deal with your stuff and live free-er. No one would argue that coffee did your big work project last week. You did it. No one would argue that your Gatorade ran that 5K. You did. But the coffee and the Gatorade help your body and brain function better. They help clear out the physical junk (like slow blood flow to the brain, dehydration, muscle cramping, etc.) that makes it hard for your body and brain to work properly. Oils are sort of like that. Except with no stimulants, side effects, additives, or toxic artificial coloring. While our body was not created for caffeine or Red #40, it was created to work perfectly with oils. The key molecules in essential oils are exquisitely shaped to fit perfectly with the cells of our body and brain to help them. It's as though they were created for each other. Oils CAN and DO help our brains, especially in the realm of the amygdala, our emotional center. Cognitive neuroscientist Dr. Caroline Leaf states, "Research shows that around 87% of illnesses can be attributed to our thought life....Studies conclusively link more chronic diseases...to an epidemic of toxic emotions in our culture (from Who Switched off my Brain? Controlling Toxic Thoughts & Emotions p.5)"
And therein lies the practicality of dealing with your emotions through "aromatherapy" : Essential oils can profoundly impact your brain, your mood, and your emotions....which then will impact your BODY and physical health. Far from being a First World luxury, essential oils have been used for thousands of years as emotional and spiritual medicine. This isn't New Age nonsense. EVERY culture in the Ancient World used essential oils, poultices and balms made of plants for medicine and for their emotions. The earliest reference in the Bible to actual essential oils is in the story of Joseph...probably around 1700 B.C.E. Moses, David, Jesus, and James (5:17)...and all the other good guys of the Bible used essential oils for spiritual and emotional purposes, NOT TO MENTION for their vast physical healing properties. AND - there's science behind it! Check out the other blog posts (that cover just the tip of the iceberg) on how essential oils work perfectly with the brain (Part 2) to un-do hardwired patterns from negative emotions and subconscious reactions (Part 1). For this post, Part 3 in the Emotions, the Brain, and Oils series, let's look at some of the specifics on how oils (and the very intentionally-blended "Emotion Oils" I've been using and LOVING) affect our moods. Sidenote: I just attended a seminar this past weekend on utilizing specific oils and blends on certain accupuncture points on the body to release very specific emotional blocks. It was profound. I won't go there just yet. For now...find what category you "need" most, and just diffuse and apply those stress-relieving oils! Orange, Citrus Fresh, Tangerine, Lime, Lemon, and Bergamot are all single oils. Citrus Fresh is a blend of citrus oils. Who can taste lime zest or spritz a lemon peel and not smile?? These oils rock my world! The oils inside the colored part of citrus peels are UPLIFTING, and alleviate the effects (both physical and psychological) of ANXIOUSNESS! Sound like hype? Check out the links to a couple studies below. WHAT they do: Help your brain let go of grief, negativity and pessimism, while stimulating the parts responsible for optimism and pleasure so you can let go of junk and get motivated. WHY (what's in them): Citrus peel oils are all exceedingly high in Monoterpenes, such as d-Limonene and γ-Terpinene. These work synergistically with the other citrus peel oil molecules. HOW those things help: Besides the hundreds of physical effects of those specific Monoterpenes, emotionally speaking, they are energizing, uplifting, and help increase optimism. Lemon Oil - Click for a study on how lemon vapor causes an anti-stress effect in mice. Because of the other effects Lemon has, it's also in the blends Transformation, Release, and Joy. Bergamot Oil - Here is a study on Bergamot reducing anxiousness in people awaiting an operation, and for teachers with heavy workloads. Because of the other effects Bergamot has, it's in the blends Harmony, Joy, and Forgiveness. Frankincense, Copaiba, Cypress, Royal Hawaiian Sandalwood, Myrrh, Northern Lights Black Spruce, and Cedarwood are all wood oils, and Believe and Grounding are blends of several wood oils. These oils are GROUNDING, and alleviate the effects (both physical and psychological) of feeling unstable, indecisive, or brain-fogged (plus a ton of other things). They go straight to our BRAINS! This is really, really good news. These tree oils have been used for incense, for anointing, for burning, and more for emotional/spiritual purposes in most ancient cultures. This is because they help the brain clear out the chaos in order to focus. WHAT they do: Help you get grounded and to stabilize your thoughts/emotions (think "trees=rooted, firm, stable"). WHY (what's in them? ): Some are high in Monoterpenes like α-Pinene and β-Pinene (see the word "pine" in there? That gives some trees a sharp, pine-y scent). Others are high in Sesquiterpenes like β-caryophyllene. HOW those things help: See that last molecule name? ^^ That one right there is one of the superstars in CBD oil for its emotion/brain-supporting, and pain-relieving powers! Don't worry... these essential oil plants are legal in all 50 states. The Sesquiterpene Secret: Sesquiterpenes are teeny tiny, itty bitty molecules that can cross the blood-brain barrier when inhaled or applied. This is AWESOME if you're wanting to get emotional balance for your brain/amygdala, and to oxygenate and heal the glands in your brain (really important). Whether you want to meditate, concentrate, pray, tune out the mental chaos, or even sleep deeply, those Sesquiterpenes are very useful for helping the part of the brain responsible for that (the Pineal Gland) do its thing. Young Living's species of Cedarwood is very high in Sesquiterpenes (up to 90%!!) and Frankincense & Myrrh are high as well. Jasmine, Lavender, Ylang Ylang, and Geranium are a few floral essential oils. 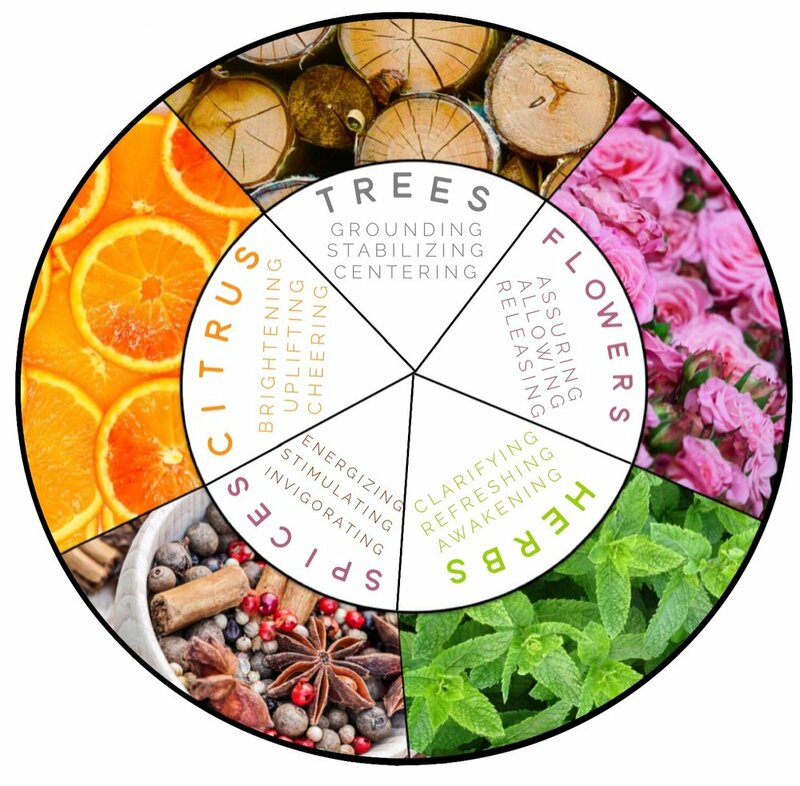 The blends Harmony, Inner Child, Release, Forgiveness, and Joy contain many floral oils (as well as citrus, wood, and herbal oils). Essential oils distilled from flowers can be REALLY pricy. Rose, Jasmine, Roman Chamomile, Helichrysum, and Neroli (orange blossom) require THOUSANDS of blossoms in order to extract just a little bit of oil. But they've been prized for millennia for their powerful emotional/aphrodisiac/spiritual effects, and their popularity has not diminished. Science now shows us why they're so alluring and effective. These are the primary components of the VERY powerful blends by Young Living such as Acceptance (free this month thru Essential Rewards! ), Harmony, Present Time, and Inner Child. The reason that smelling a rose or jasmine flowers is intoxicating and pleasurable is due to the powerful oil inside the blossom! WHAT they do: De-stress and relax. PLUS... they help turn off the inner critic that cripples us, tune out the lies of shame, worthlessness, and failure... and just accept who we are. (i.e., holistic stress-relief). WHY (what's in them? ): Most are high in Esters like linalyl acetate and benzyl acetate. Others are high in Alcohols like linalol, linalool, and geraniol. Plus - the frequency of flower oils (everything on earth has a frequency) is relatively high...between 80MHz and 300 MHz. HOW those things help: Flower oils are WELL documented for the release of anxiousness in the clinical world. Check out just a few of the studies below! While those big-named molecules listed above don't do much in isolation, there is a synergy effect in the oil that helps the brain let go of stress and junk, receive comfort, and get balanced. Furthermore - the high flower oil frequencies help to raise the energy of our cells and in our emotions! These studies show just a few of the reasons why those Emotional Blends like Harmony, Release, Joy, Inner Child, Forgiveness work the way they do. Gary Young was the first to develop blends of this nature, carefully and intentionally selecting different oils based on their frequency and their chemical constituents to hone in on specific emotional blocks in the brain and body and release them. Peppermint, Rosemary, Eucalyptus, Lemon Myrtle are all wonderful herb-oils. Purification, R.C. and Clarity are blends. These are usually PHYSICALLY very cleansing & purifying for any microbes, etc. Emotionally, they work in a similar way, to clear out the fog, sharpen the mind and wake up the brain. WHAT they do: Lots of things. Here's a few: they increase alertness, energize, and renew the mind. WHY (what's in them? ): Most are high in Ketones like carvone and menthone (=think menthol/mint!) Others are high in Ethers like 1,8-cineol, and in Aldehydes like citronellal and geranial (think citronella and geranium). HOW those things help: In synergy with the other oil components, they help bring clarity of thought and awaken the mind. One of my favorites in this category is Lemon Myrtle...it's more lemony than lemon, and has a zingy, "get-out-of-your-procrastination-rut" effect on me. Peppermint and Rosemary are also gems for getting in gear and clearing the cobwebs...and there are studies to measure and show their effects! Cinnamon Bark, Black Pepper, Nutmeg, Clove, and Cardamom are spice oils. Light the Fire, En-R-Gee, and Thieves are great blends of spices. These are PHYSICALLY very cleansing & purifying for any microbes, etc. They also help to stimulate, energize physiologically, which then has an emotionally uplifting, get-in-gear affect on the brain. WHAT they do: They can provide physical energy, which is emotionally stimulating. They also help wake up, invigorate, and motivate. WHY (what's in them): Aldehydes like cinnamaldehyde (think cinnamon! ), Phenols like eugenol, and Monoterpenes like α-Pinene β-Pinene. HOW these things help: They support your adrenal glands, pancreas (blood sugar stabilizer), help with blood flow and stimulate the brain, all of which provide physical energy. Diffuse! Diffuse the oils in an diffuser. If you got your starter kit, you already have one that comes with a one year warranty! This diffuser is ultrasonic and doesn't heat up/damage the oils. Sending these oils airborne into your bedroom, office space, or family room literally can change everyone's mood. Huff: Sniff directly from the bottle, or put a drop in your hands, rub together, cup your face and inhale. Perfume: Take a drop and put it on your heart and pulse points like you would perfume. OR - make a roller-ball bottle (use 1 part essential oil to 3-4 parts carrier). Massage: Rub a drop peppermint or rosemary into your temples to wake up your brain, or massage your shoulders or feet with lavender or ylang-ylang to let go of that uptight feeling. Physically, my life has changed for the better since using oils to support the function of my body.